There is a secret little part of Manhattan that I like to call "Times Square". It is the perfect spot to meditate, unwind and enjoy the peaceful quietness. 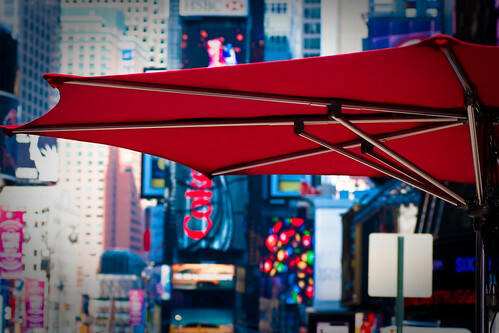 My Times Square is even more idyllic now that they've added these wonderful umbrellas. It is so nice that I'm hesitant to even post about it for fear that it will be discovered by the masses. I like this photo and it's colour ! So good you have ypur own paradise to relax !